One more month of winter! With the weather getting harsher and seeming to go on forever, the Hoodooist thought we better cover another warm-up cocktail spot for the rest of the season. The Le Chalet bar/restaurant pop up at Selfridges has been set up by the excellent Q Grill London on the roof of the department store with its own express lift to hot choctails and winter comfort food. A becouched and bequilted indoors and heated outdoors make for a versatile experience regardless of the weather outside. Let’s get down to business though, in drinks, Le Chalet offers either winter-themed cocktails, or boozy hot chocolate – not as thick and indulgent as the hot chocolate at Floridita’s Ski Chalet Pop up (Click HERE for Review! ), but making them easier to drink here. The most successful of the hot choctails tasted was easily the Hazelnut, hazelnut liqueur, almond liqueur, dark chocolate liqueur – tasting pretty much like a liquid Ferrero Rocher. A perfect dessert drink. The Dominican adds Brugal spiced rum and cinnamon liqueur to the hot chocolate, to warm you up nicely – however, there seems to be some conflict in flavour, although this could be up to personal taste. The rum brings the toffee and caramel, as well as some pepper, maybe Demerara? Worth trying out to make one’s mind up. An enjoyable topping of whipped cream and cinnamon. The Choc-work Orange (brilliant): Orange liqueur and dark chocolate liqueur in a hot chocolate: somehow, the weakest of the three – too intense on the orange, doesn’t quite work. The Honeycomb Old Fashioned is actually a great idea: Maker’s Mark whiskey, whisky barrel aged bitters, and instead of sugar, a slowly melting slab of honeycomb. Initially the Maker’s Mark is intense, but increases in honey sweetness as the honeycomb melts away. Halfway through, the honeycomb becomes intense with a buttery sweetness, and takes longer to finish. Give yourself a good while to drink this, and though great when bitterly cold, I can’t imagine having something so dense and sweet on a warmer day. Brugal spiced rum, gingerbread, lemon and egg white make up the Gingerbread Slipper, not too a fairly citrus drink that takes the edge off the lemon with the gingerbread, that mainly mellows it out. Nothing complex, and lacking a bit of character. Service-wise, no complaints. In summary, Le Chalet is a great place to pop by when in the area before the end of February, hot choctails to enjoy after a wee bit of shopping. Happy Burns Night all! To celebrate, we thought of the perfect place to celebrate this Sunday, and hey, if you’d rather have a cosy night in, we’ve thrown in a couple of whiskey cocktails to make at home at the end of the article! 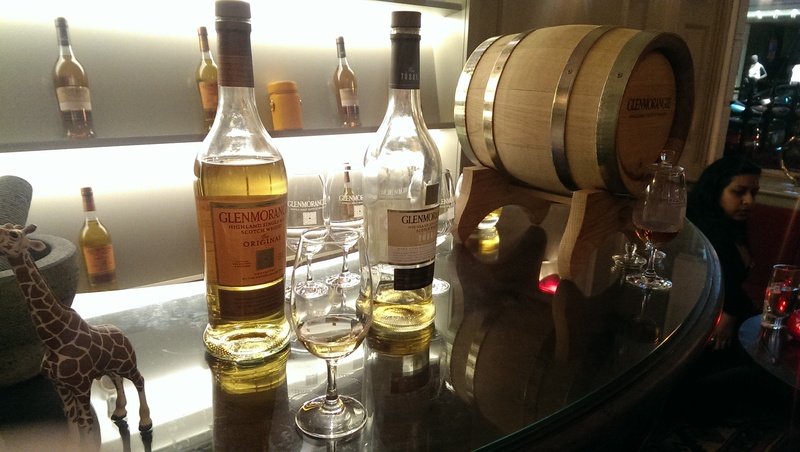 Running till the 8th of February 2015, the Brown’s Hotel is hosting the SCOTCH pop up in their Library room, exhibiting 40 different Scottish whiskies and couple of scotch cocktails – A tribute to their sister hotel, the Balmoral’s, SCOTCH Bar. Whisky Ambassador, Fraser Robson, has whiskies from all over the traditional regions at his disposal: Speyside, Islay, Campbeltown, the Islands, the Highlands and Lowlands in a variety of blends, malts and vintages dating back to 1940, and what a brilliant collection it is. Running from 15 pounds a dram, up to 400 (the Glenmorangie Pride 1978), the choice of whiskies is intimidating at first, but easier to traverse through with the brilliant Mr. Robson guiding you. 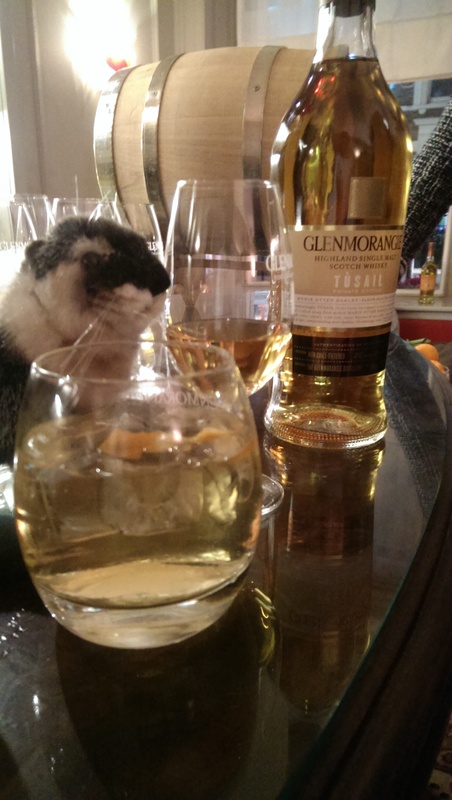 For reference: Glenmorangie stills are as tall as giraffes. Sponsored by Glenmorangie, best to start their event with the Glenmorangie Original: a demanding golden yellow, a classic whisky. Intensely citrus on the nose, the initial flavours are more flowery, with a dark citrus length. 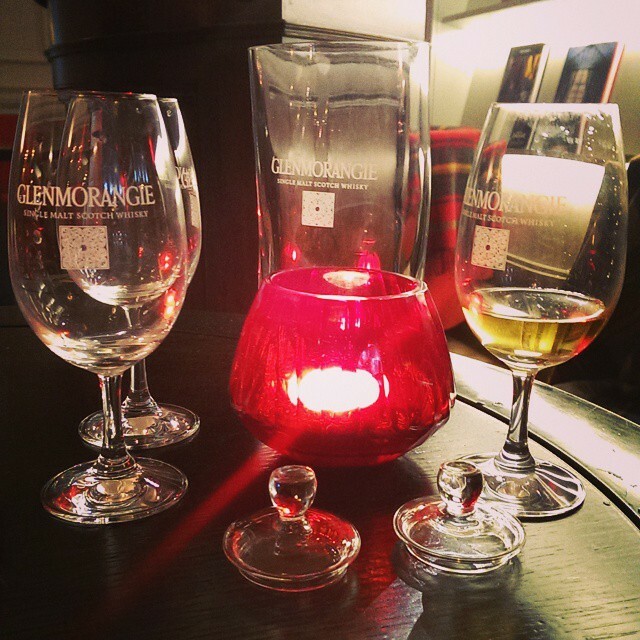 However, more discussion revolved around the launch of this year’s Glenmorangie Private Edition: the Tùsail. Attempting to keep the same mash and method of the Original, the Tùsail differs from the Original by using Maris Otter barley – used only by a select few considering the difficulty and cost of production compared to commercial barley. But boy, is it worth it. A spectacular amber harvest gold; the nose is much sweeter, almost toffee, maltier and earthier. A deeper flavour, the toffee and barley come through rather prominently, something spicy and nostalgic (I may have gotten some dark chocolate too), an intensely winter scotch. Absolutely beautiful, the Hoodooist is in awe of the Tùsail. 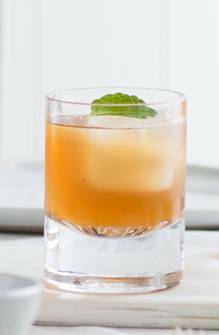 For cocktails, the first simple Orange Zest brought out the complexity of the citrus of the Glenmorangie Original with ginger ale and Angostura bitters, a simple enough drink, but a refreshing and effective one. 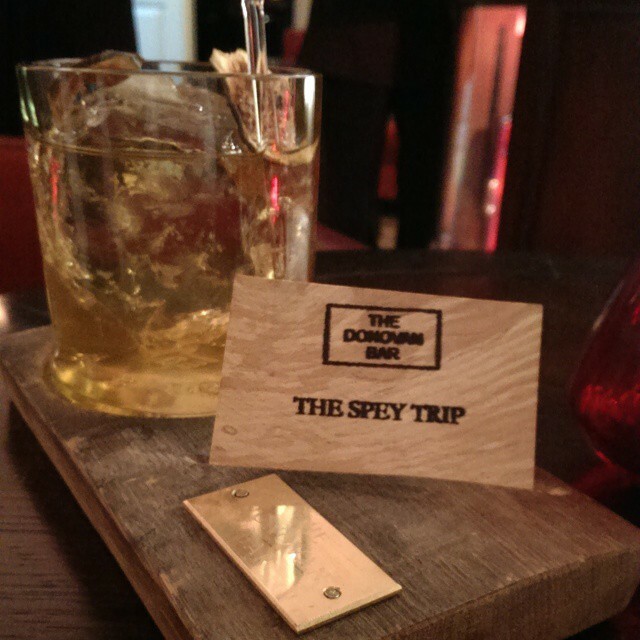 The second, the Spey Trip, is a fascinating drink, inherited by the SCOTCH pop up from the hotel’s resident Donovan Bar. Inspired by the Balvenie scotch it uses, and the Speyside region it hails from, the Spey Trip is constructed entirely from the scotch and its containers. The tumbler is the laser-cut bottom half of the Balvenie bottle, the platform it is served on also made from the Balvenie casks. An Old Fashioned using figs instead of sugar syrup, a spectacular drink that brings out the spicy sweetness of the Balvenie with the fig, which also appear as dried garnish (which dipped in the Old Fashioned taste incredible). I was left torn about this drink by the end of it, since the first half was wonderfully layered and complex, but the last half became overwhelmingly sweet with the figs. And a whisky like Balvenie is a shame to lose. The SCOTCH bar’s atmosphere is perfect for the venue, relaxed, subdued, with the occasional tartan – the Brown’s Hotel itself is a stunning building (from 1837), the interior sprawling, and couches numerous. And service is impeccable. A fantastic addition to the London whisky scene, and one I wish was permanent. HEY. YES. THERE IS MORE. I mean, it *is* Burns Night tonight, and if you’re gonna stay in, might as well do it with a couple of easy to concoct cocktail at home, devised by Alexander & James. A refreshing tasting whisky cocktail which combines gentle spice and fruitiness perfectly. 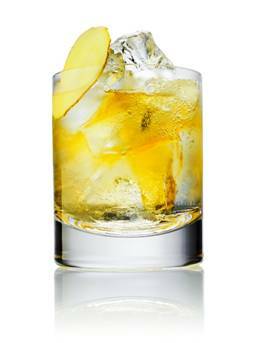 Built over hand-cracked ice in either a highball or tumbler, garnished with a long slice of root ginger (ideally cut with a mandolin). But hey, say you’re more of a bourbon person (what the hell are you doing here?) but say you are, we haven’t forgotten you! That’s all, folks! Make sure to enjoy your Burns Night with your favourite scotch – we know we will! Ah, MASH. The Danish-American steak venture is bound to have a surge in bar visitors with the introduction of their new menu, taking on more international (particularly Danish) influences. MASH’s enormous Lynchian red and black pseudo-Deco décor retains that element of American-but-not-quite, and I must still recommend seating right up at the bar for the best lighting and experience with the wonderful bartenders and service offered (the service, as always, was impeccable. It’s one of MASH’s greatest strengths). This is, of course, if you are coming for the bar and not for the meal, in which case there is the gargantuan restaurant and red booths that are open to you. However, one must recommend the bar snacks, especially the MASH tartare and chilli fries. So the cocktails! Though the new menu is meant to evoke a trip across the USA, one will see inspirations from Scandinavia, Central Europe and Italy. And though it has kept a small handful of drinks from the old menu, MASH has developed a large and innovative new selection. Often working with spirit companies to help create bespoke glassware for their drinks; personally, the glassware can be a highlight of the drinking experience here. Though we went through the entire new menu, let us cover the ones that stand out here today. 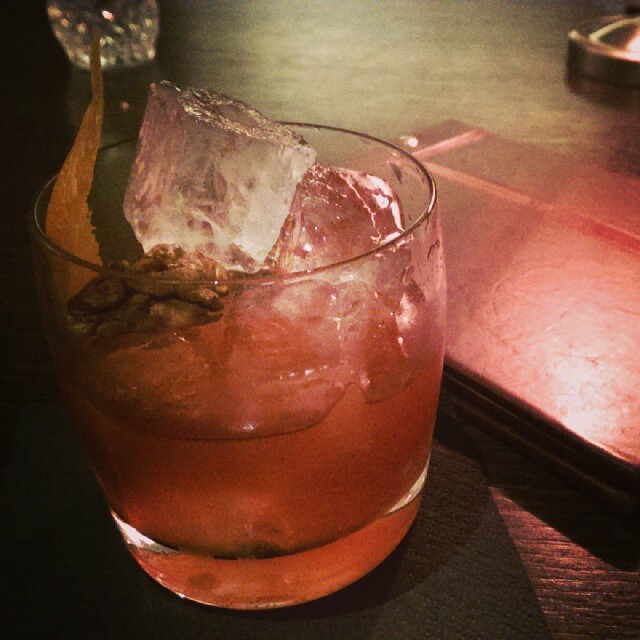 First, let’s get one of the drinks from that has remained on the new menu from the last one – with good reason, it is excellent: the Woody Woodpecker was covered in our review of the 5th day of London Cocktail Week 2014: CLICK. And let’s get one of our favourite drinks out of the way: The Yosemite is incredible. Ketel One Vodka, St. George Terroir Gin, Becherovka liqueur, pine, maple, almond and lemon. How does one describe this drink? It was the moment I stepped out of a plane to face the vast, intimidating forests an hour outside of Stockholm. The crispness of the wind and that silent-noise that comes with being surrounded by pine trees. For some reason many expect a pine inspired drink to come off a bit medicinal, especially with Becherovka, but this certainly isn’t – the Yosemite is a masterfully balanced cocktail. A smooth mouthfeel with a late tingle finish, and long length. On the nose, a brilliant array of light herbs, sage and pine. Flavour-wise, a complex arrangement of bright, crisp flavours. Initially, a cold wake-up call of the Ketel One’s signature citrus and the pine, followed almost immediately by the gin’s sage and Douglas fir. The maple is introduced to work well with the bitter notes of medicinal Becherovka, letting out its more spicy botanicals, like clove (and maybe ginger?). Finally, the almond brings the rollercoaster to an end. What a killer drink. On the same tangent as bright and citrus, the Solvang is another great addition to the menu. 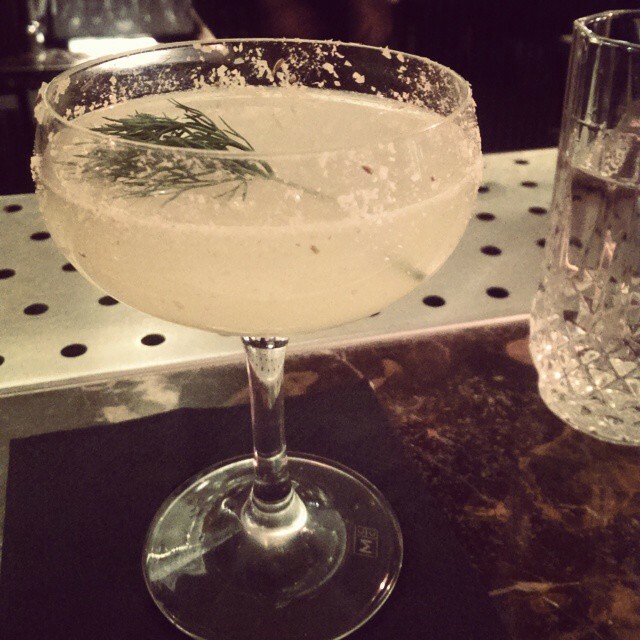 Dill Akvavit, apple, celery water, lemon with a rim of smoked salt and fennel seed finally gives Akvavit the attention it deserves in London. Your first experience will be the perfectly salted rim: smoked salt and fennel seeds, which complement the drink exquisitely. The primary flavours of the cocktail are initially, the citrus, then the dill akvavit, and finally the celery. You’ll notice the apple plays more a part of restraining some of the flavours rather than masking them or taking a prominent place. And excellent aperitif. The Little Italy is a complex gastronomical cocktail: Martini Rosso, apple brandy infused with porcini mushrooms, Amaro, bitters, granita of cherry and parsley. This presents one of the most impressive glassware in the house. 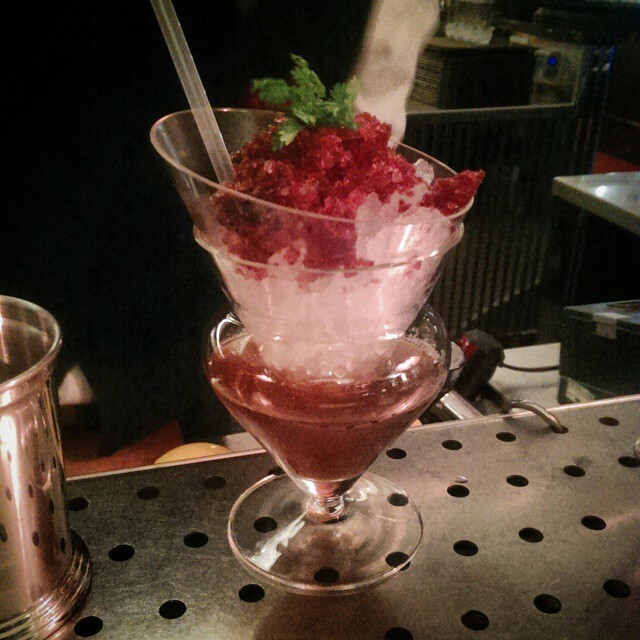 The cocktail itself is poured into a warped Eiswein glass, with an upturned cone places above it, with a straw running into the cocktail, and enough space for the cherry and parsley granita above to dilute and pour into the cocktail, sweetening the flavour as time goes on – you are also provided a spoon if you wish to attack the granita yourself. The drink is powerfully Martini Rosso with its rounded red fruit flavours, followed by the slightly herbal Amaro and bitters, finally ending on the apple brandy and the earthy woodland notes of the porcini mushrooms and cherry granita. Though a complex and good drink, well balanced and not too herbal, I feel it satisfies my intellect more than my palate, purely out of the intense sweetness of it, I suppose. But still a drink I highly recommend – especially that since it uses so many ingredients associated with an aperitif, it is very much an after dinner drink. On the note of after-dinner drinks, the Seattle Set is an interesting twist on an Espresso Martini. Zacapa 23 rum, matcha tea, chocolate, raspberry vinegar and coffee. Beginning with the initial harsh hit of coffee, with the rounded, green, velvet mouthfeel of the matcha and its bitter tang, the toffeeness of the rum introduces the chocolate and beautiful addition of the raspberry vinegar – slightly tart, and adding a great dimension to the cocktail. It tastes more like a raspberry liqueur chocolate than an espresso martini. But things are about to get stranger. 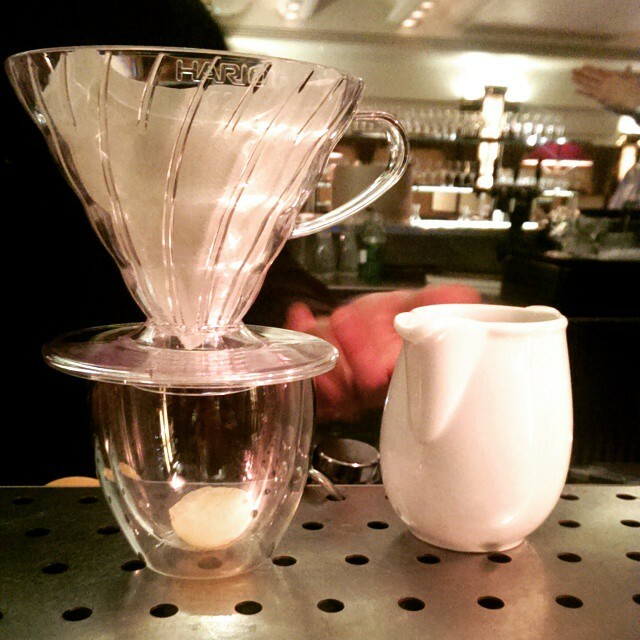 The Mad Hatter is a hot tea-based cocktail that uses a V60 to prepare. The entire thing is complicated with heating of the pre-prepped concoction poured over a dry tea blend. Bulleit bourbon, crème de peche, maraschino, hibiscus, and a hint of vanilla is heated and poured over a tea blend of many ingredients, including apricot, peppermint, and stevia leaves, over a frozen ginger and lemon gelatin. I’m not sure how I feel about this drink – on one hand, it is still pleasant, on the other, the flavours kind of assault you all at once. Let me explain. The orange concoction begins with a punch in the face of peach, bourbon and apricot all at once, settling on the ginger and peppermint at the end. It’s all quite overwhelming – and yet, still pleasant. It manages to be warming and inviting, and yet not too reminiscent of having a cold, though you notice the similarity – so it’s an excellent job to not be medicinal. Also, drink it quickly while it’s hot. Let’s tackle two drinks that are good ideas, but in practice can be a bit more difficult, and certainly target the more experienced drinker. Subtlety is the key to these two. First, the Binchotan uses a stick of Binchotan Japanese charcoal to filter and mellow the normally sharp flavours of Bulleit bourbon, with coconut, cardamom, Cynar and sugar. The technique used to mellow the bourbon though, also mellows out the rest of the flavours. So one needs to focus to get more out of the flavours than just the Cynar and hint of coconut – it does risk becoming an Old Fashioned to the less experienced palate. Perhaps adding the flavours to the Binchotan filtered bourbon after instead of keeping them in the same pre-prepped bottle might help. I like the idea of the MASH logo printed on the ice, but not when the ice is taller than the glass, making it an interference to drink. A good drink to relax with altogether, though somewhat underwhelming. Another drink in this category would be the Sipper. The custom glass it is served in was developed by the MASH team to provide a specific pour for the drinker, to coat the tongue and focus the heady vapours directly to the drinker. A very good idea, generally. The flavour pack is added in a very low ratio: Corn whisky, maraschino, chocolate, absinth, orange bitters. The first taste just screams whiskey, followed by chocolate and orange bitters. The absinth is more ambient. An intriguing drink if you have a long while to sip it. You want food to accompany this one. Finally, the most enigmatic of the menu, and certainly the riskiest to order. The Test Tube. 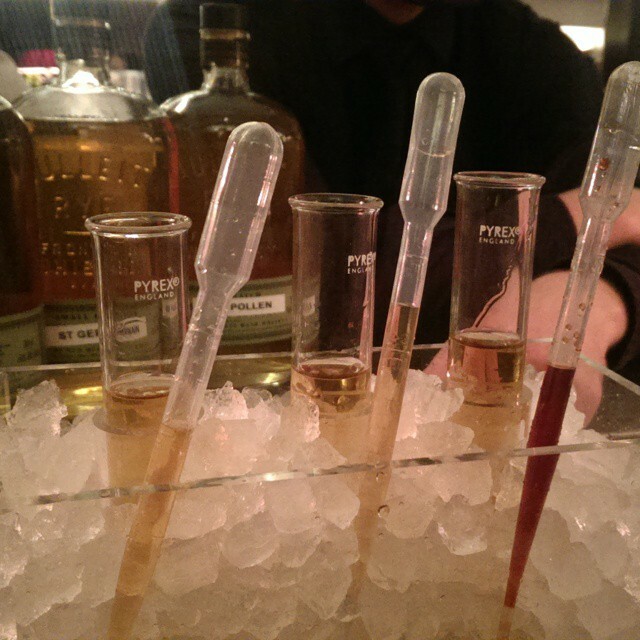 The Test Tube serves up 3 test tubes of Bulleit bourbon infused with different flavours. First, Violette, then St. Germain elderflower, finally, apricot bee-pollen. You are provided droppers with 3 separate bitters, recommended for each infusion: Angostura for the Violette, peach for the elderflower, and orange for the apricot bee pollen. Either way, you are encouraged to experiment to find your preferred flavour. As you can see, it is certainly not for the novice, since if you mess up a test tube once, fixing it would not be possible. First to keep in mind, it is a sharp drink, bourbon fans primarily. I found that if you stuck to the recommendations, elderflower/peach was the most accessible. However, my favourite ended up being the apricot bee-pollen, with two bitters, Angostura and Orange at a 1:2 ratio, after it chilled a bit in the ice casing. The West Side Apertivo (Tequila, Kamm & Sons, rhubarb, apple, lemon, almond and pink peppercorn syrup) ends up too fizzy, too orange, too tart. It’s the one drink other the Test Tube I don’t see myself ordering again – the latter primarily because effort *bent wrist to perspiring forehead*. All in all? What an exciting menu! It is a major improvement on their last overly sweet menu, and has matured, finding its place in experimentation and involvement of various senses. Coupled with their incredible service, MASH is surging high up the list for innovative cocktails in London, and getting to be one of my most favoured places in Soho. 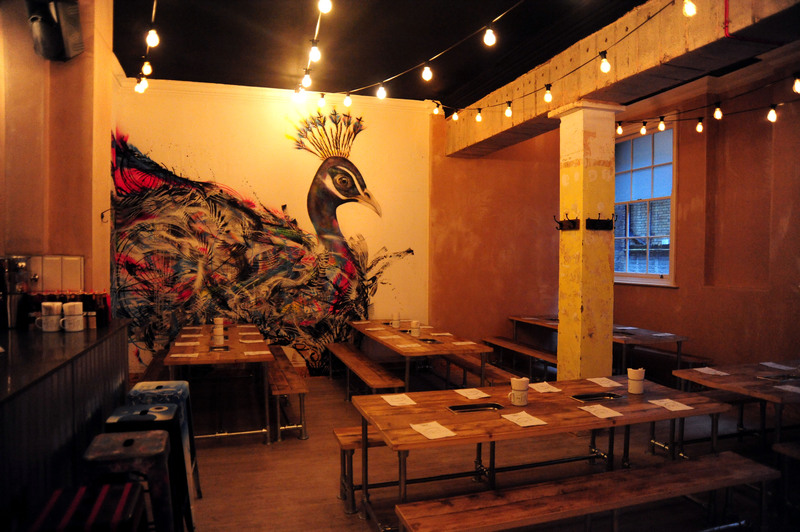 Exposed brick, bare wood, wall art, refectory tables and festoon lighting – perfectly average day in Hackney, but then you realise you’re in Marylebone. The doors into the new Joint just a few minutes away from Bond Street operate like a kind of wormhole into east London or Brixton Village, uncannily – The Joint is a fantastic addition to west London’s repertoire. 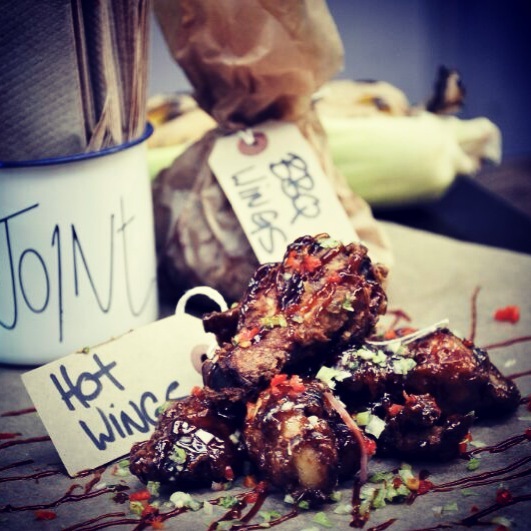 Turns out, the Joint *was* a pop up in the Brixton Village Market, specialising in American BBQ and mastering the slow-cooked pulled pork burger, now with more than one permanent site in London with good reason. On the note of Brixton, one of the most fascinating aspects of the Joint is the buns, the signature fig and vanilla sourdough buns are prepared by the Bad Boys Bakery of Brixton Prison – where co-founder Daniel Fiteni runs a rehabilitation program to employ former-inmates as apprentices once released. Thanks to the benches and messy meals, you want to come here with a group of friends; it’s the best way to make the most of the fun atmosphere. A smallish venue it may be, but if you possess an entire table (of 8, normally), it feels surprisingly private. Grabbing myself a beef brisket with smoked aioli, bacon relish and salad in a potato bun, I find myself not thinking straight for a good hour – prepared fantastically, with sides of spiced-just-right hot wings, cob, fries, onion rings and the tenderest of ribs. The Hoodooist is in love. But let’s get onto what we’re here for: the cocktails. The Joint offers a short, well-priced list of drinks, with a tendency to long drinks, served casually, often colour coded with straws. The Figgy Old Fashioned was a guaranteed choice for first drink: Bourbon (Bulleit, I suspect) and Angostura bitters, naturally with figs and vanilla, and interesting combo. The vanilla itself is more aromatic, and comes into play late in the game. The fig is subtle, yet unmistakable. It hadn’t crossed my mind that it would go so incredibly well as an Old Fashioned, but was pleasantly surprised. Highly recommended. 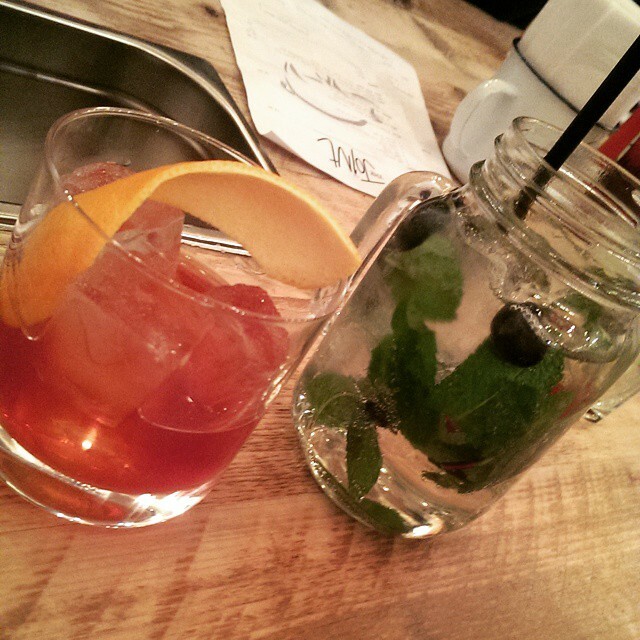 The White Sangria, not here is an intriguing combo: Chenin Blanc, Crème de Peche, mint, berries and sprite. Crème de Peche is a great choice to complement the Chenin Blanc’s peach flavours. After the initial intense punch of peach, the berries and mint enter for a brief moment to eventually make way for the dry acidity of the Chenin Blanc. A light cocktail perfect for the early afternoon, it is also a sneaky one, getting you tipsier faster than you thought. Chilli and Margaritas have always been a good combo, and so is the Scotch Tommy’s. A Tommy’s Margarita (tequila, agave, lime) with lemongrass and scotch bonnet pepper, you get a bright, zesty drink with some serious kick! The initial savoury, yet innocuous, lemongrass suddenly bursts into a fun spice from the scotch bonnet before subsiding again to enjoy the tequila. Love it. 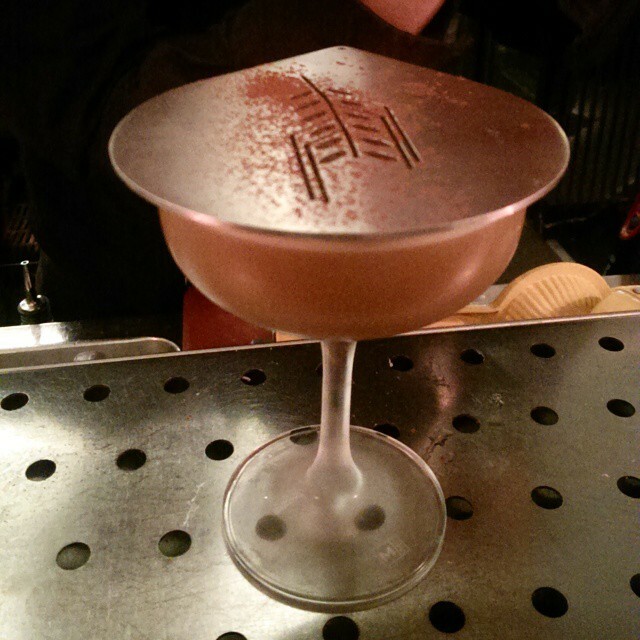 I look forward to return and try out the Peppertown: Rum, pink grapefruit juice and black peppercorn syrup. Unfortunately, there was a hiccup with the Soft Punch, which is ill-conceived from the outset really: vanilla infused vodka, absinthe, honey and lemon. 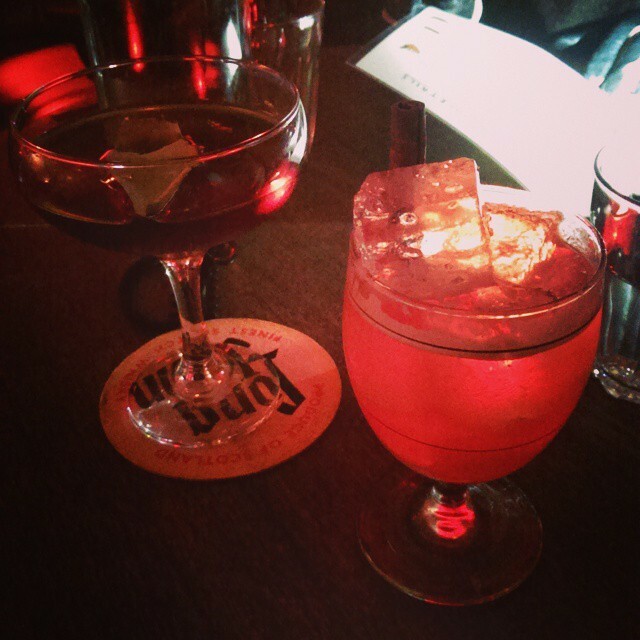 A lemsipesque drink that is an unpalatable mish-mash of flavours. The confusion of flavours was a similar problem faced by the Bloody Bacon, a shot of bacon-infused vodka with slat rim followed by a spicy tomato juice chaser. 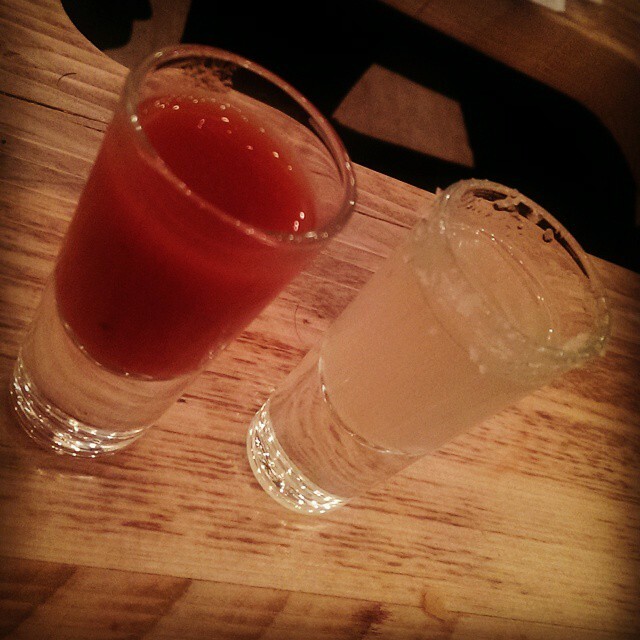 Sounding like a deconstructed Bloody Mary, it doesn’t quite work in shot form. But who cares, with the Figgy Old Fashioned, Scotch Tommy’s and White Sangria being excellent, it’s easy to give the above a miss. Service was smooth, polite, but could do with another server, especially if ever as full as they were that night. Nonetheless, no worries about the orders. In short? The Joint is a wonderful new space for Marylebone, uncharacteristic as it is for the area. They might not be the most complex of drinks; simplicity is on their side, being effective and with excellent value for money. 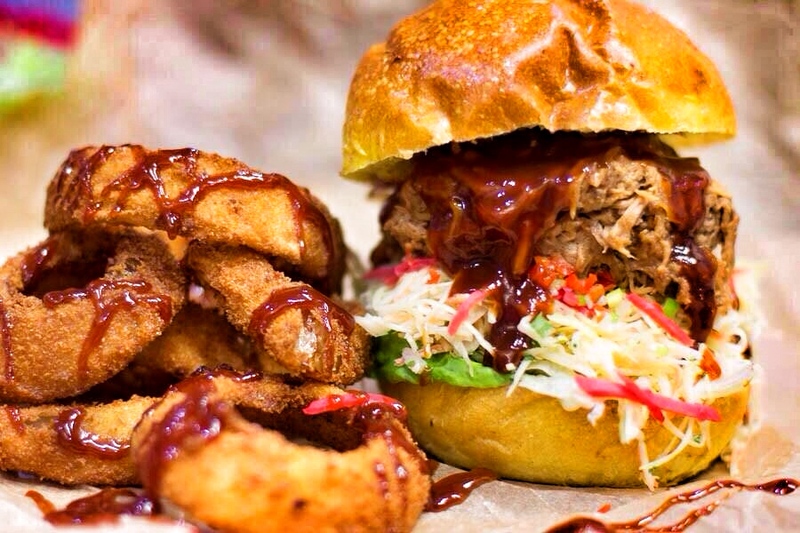 Devilishly delicious barbeque, it’s great to have a place to escape to from crowded Bond Street. I’ve avoided writing this one up for a while. But here goes. The sensible will have made up their mind immediately after the following anecdote. If one continues reading it really means one’s mind can’t be changed regarding visiting Aqua. After putting bags through scans and metal detectors, and being sent in the wrong direction, whilst being bothered by several employees en route asking “Are you going to Aqua?”, we finally make it there in all its hotel-lobby-designed glory. A massive space that really needs a bit more lighting at night, utterly packed with people that leave their jackets littering the floor. Snatching the nearest available table, we observe our bartender, whipping out a pair of coconuts, chopped in half, to prepare his drink. In the four halves, he pours his ingredients, and hands the coconuts to the punters. Except, two of the coconuts are empty. Baffled, he refills them and hands them over. And yes, a third time he tests his quantum coconuts. A third time they are empty. Because unbeknownst to him, but very visible to us, we see his arms soaked in the cocktail pouring out of HOLES CUT INTO THE COCONUT SHELL. This ludicrous display of wasted spirits was interrupted by a stereotype of Aqua frequenter: an annoyed looking young person wielding McQueen, and a collection of massive bags from her shopping trip, repeatedly exiting and entering the bar (all the way up the stairs, out, and then back and down again), but not seemingly doing anything. In a huff, she does this a record 5 times, whilst hitting several punters’ heads with her bags and not caring that she did. And the staff not caring either. The Skyline Cooler: Ketel One Citroen Vodka, Cinzano, absinthe, apple juice, lemon juice, elderflower cordial and fennel seeds – the fennel is mostly drowned out, even the Cinzano, normally a very detectable flavour, is half lost in the juice/cordial overdose. And a volatile ingredient like absinthe probably should not be left in the hands of the coconut fellow above – evident with the overpowering sourness of the drink. A second tequila and gin drink wielded similar lemon-juice-abused results. A foul citrus nothing for 13-16 pounds? London is far too wide and full of treasures for these shenanigans. Aqua suffers a similar problem as ME London’s Radio Rooftop, where a spoilt 20-something feels they deserve a pat on the back for standing a few floors higher up. Much like that recent London real estate ad that has caused such controversy recently, “Having the world at your feet”. A destination for fans of Ayn Rand who don’t know what Objectivism actually is, the Aqua Shard becomes a testament to the tasteless. So I looked out the window at the view, hoping to god the histrionics behind me weren’t real and I wasn’t actually here. Service: What service? The staff is all queued outside giving directions. One can’t really call Ruby’s ‘hidden’, exactly. 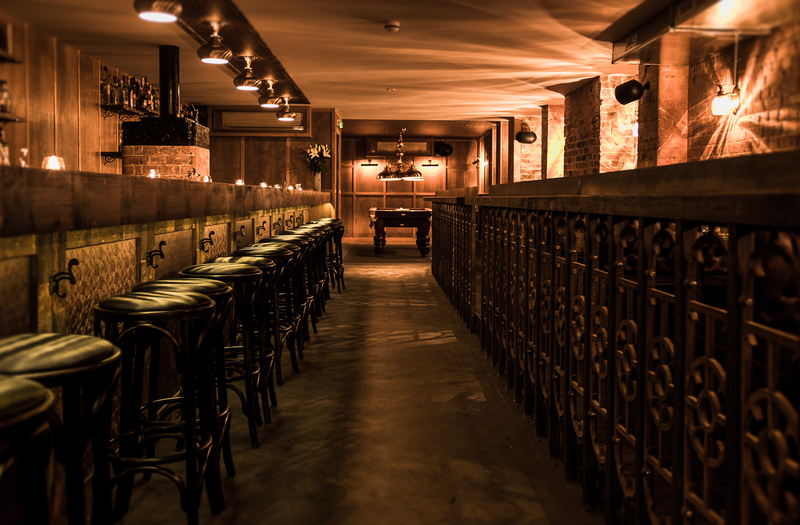 Under a cinema-style sign, an ominous red stairway leading into the basement opens up a small, shabby chic style venue very reminiscent of the King’s Cross Simmons Bar. The menu is divided in two, the permanent menu and seasonal – we decided to take on 2 seasonal, 1 permanent and 1 classic drink. 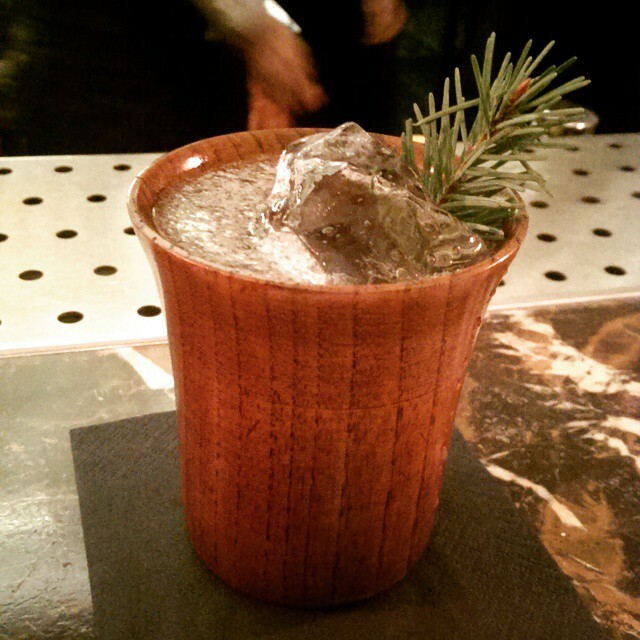 The seasonal Bitter Stump: Bourbon, Cynar, Benedictine, Bitters is exactly the kind of drink the Hoodooist would go for – it even comes with an artichoke…leaf? Thingy. ‘Bract’ (thanks, wiki). Wait, it is a kind of leaf. Yes. Alright! So the first half of the drink is greatly enjoyable, with the bourbon giving way to the Cynar balanced by Benedictine. But halfway through, it becomes very, very sweet. It could do with more Benedictine and bitters, I’d imagine. Loving the drink if it managed to keep its more savoury flavour all the way through. The seasonal Nordic Cruise, with its winter style, takes on a similarly sweet personality. Pimento Dram, Cognac, Pear liqueur and cloves/cinnamon – starts off pleasantly enough. An enjoyable winter drink, the smoothness of the cognac and the pear initially, then the cloves and pimento dram. But about halfway through the flavours kinda dissipate, leaving a flat drink. Drink this one quickly. 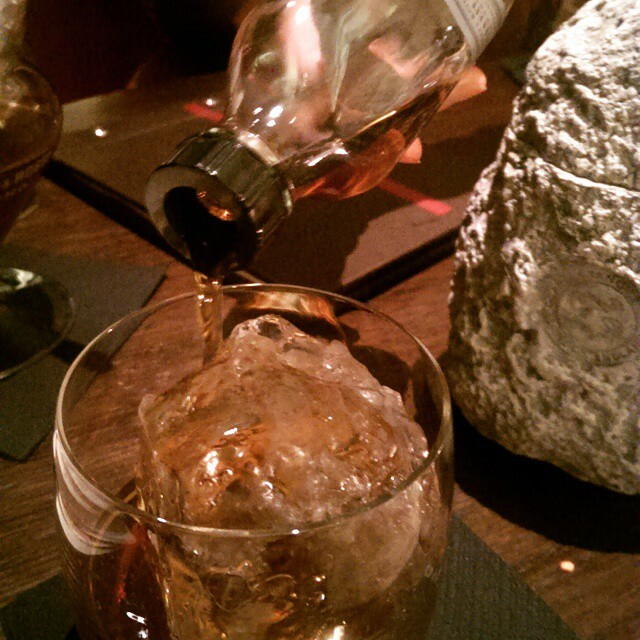 The Kurimi is on the permanent menu: Nikka whisky, liquorice, black walnut. Seeming like a good idea at first, it turns out the latter two ingredients far outweigh the first, leaving a pleasing flavour, but far too sweet for an entire drink. A Buffalo Trace bourbon Old Fashioned, is made excellently. Service is polite and quick, no complaints there. Really, the only concern in the imbalance to sweetness in the cocktails here, the menu tends toward the sweet as is. If there are complaints, it’s more about the choice of house cocktails than of anything else, since the bartenders are talented. Of course, if these are flavours you enjoy, you will probably take to them far more than myself – but it would be nice to see slightly harder and drier drinks on the menu, too. Especially when the Old Fashioned came out that well. Maybe the next seasonal menu? Fingers crossed! Ruby’s is a unique little spot on the up and coming Stoke Newington Road, and is a fun place to hang out over a drink, but probably more so for classics than house cocktails. Yes, Alastair Burgess and team of Happiness Forgets (Click HERE for review) are back with a vengeance with Original Sin in Dalston! 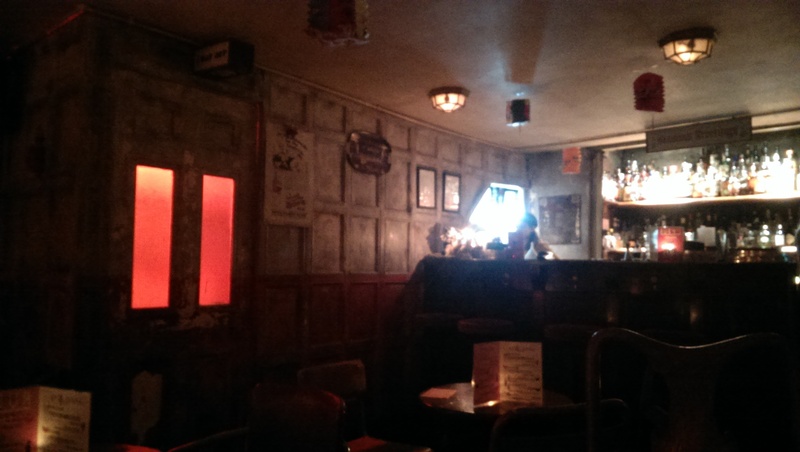 The basement below the Stokey Bears burger venue above ground becomes the dark and seductive Original Sin. Original Sin is both very similar to, and very different from Happiness Forgets, and those who’ve been to both will understand. Sin’s set up is similar to an expanded version of Happiness, decked out in hardwood and bronzed lighting. The menu is quintessentially Burgess as well, and the crowd typically Happiness. Though less claustrophobic than Happiness, Original Sin is still packed with punters. The cocktail menu is short, and unpredictable. The unique combinations of ingredients make it difficult to anticipate the flavours of the drinks, so you just have to go for it – but what a fantastic menu it is. The Perfect Storm comes right from the Happiness Forgets menu: Dark rum, plum brandy, lemon, honey and ginger. And a perfect storm it is, spicy, tangy and a whole lotta fun. Once you’ve been hit by the ginger full force, then the plum brandy, moving into the dark rum and finally settling again to the honey and intense ginger – highly recommended unless ginger isn’t your thing. You got to love it to enjoy this one. Mr. Sandman is perfect for this time of year: Remy Martin, allspice, lemon, maple syrup, ginger and egg yolk. The first thing that struck me is how well the yolk has been handled here. Shaken just right to not curdle or become too thick. Lightly spiced, the allspice is more present than the ginger, but doesn’t overpower – it’s the maple syrup that stands out (not often that maple syrup is a powerful flavour in a drink, I find). Incredibly well balanced, and one of the few traditionally Xmas style drinks the Hoodooist has enjoyed. The only drawback being trying to stop singing Mr. Sandman after. The winner of the night has to be the Sea City: Mezcal, Cachaca, lemon, Agave, salt, mint, egg white and soda. We had no idea what to expect when ordering this one, but it turns out the name is far more enlightening to the flavour than the drink – bright, lively, exciting. 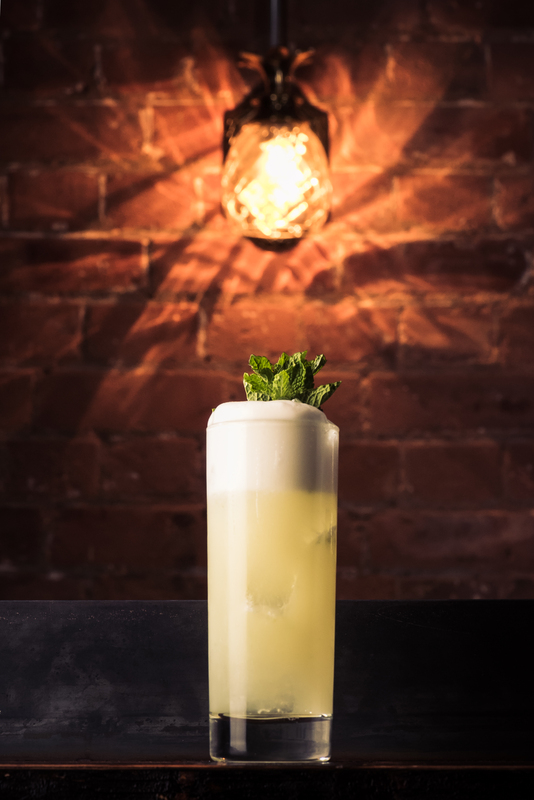 The background smokiness of the mezcal lingers throughout the drink, but begins with the intensity of agave and Cachaca, followed by the lemon and salt, with a hint of mint at the end, this entire drink is a roller coaster. Amazing. Service is excellent: quick, with a good number of staff, major plus. The only drawback I experienced at Original Sin would have been the feeling that people were always crowded in on you even when you were seated (perhaps that was the result of the loud speakers?). I can see a stricter limit on entry (like the stricter limit enforced at Happiness Forgets) greatly benefiting Original Sin. 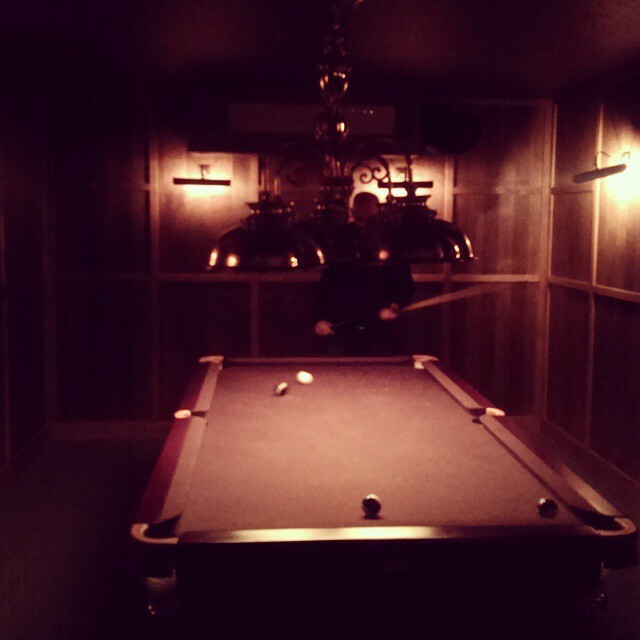 I love the idea of having this great bar as a nightcap spot, popping by at 1AM for a last drink and round of pool – so a firm favourite on Stoke Newington High Street to round a night out. A must visit! Original Sin is currently open, but will only take reservations from January 2015 onward.